Margie and I just love our new Catsperch Summit. 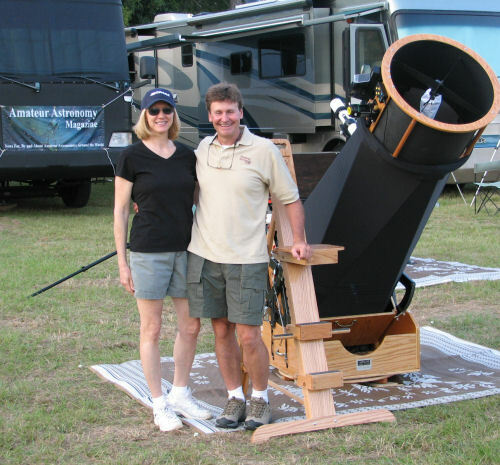 We observed several nights until 4:00-4:30 with it, and we both agree that it is one of the best upgrades to observing comfort that we have made. It was great to just sit back high in the air and enjoy surfing around the Veil at just about meridian. We found ourselves looking much longer and more attentively at objects because we were not limited by half steps on the ladder, uncomfortable scrunching and “aching backs”. It is a terrific product, and we wish you continued success with it. Ron, I am amazed by the beautiful Original Catsperch that you made for me. The packaging was great, and the extra shipping costs here to Switzerland, Europe, totally worth it! It was assembled in five minutes. 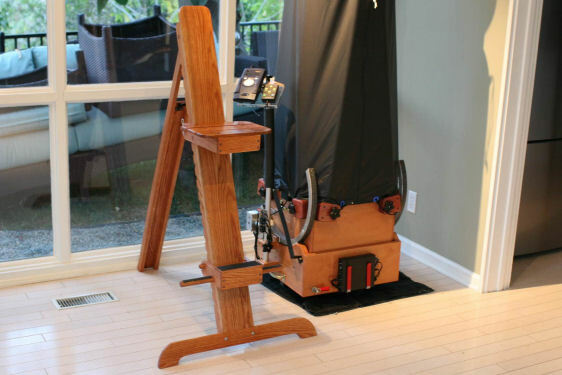 Just top notch quick assembly and efficient use, on top of it excellent quality! We Swiss love nice quality work, and your work was perfect! The seat cushion is also very well made. Your communication during the production period was also very professional. Thank you so much and I will be returning as a customer in the future, my eyes are already set on an eye piece case! Doing business with you is simply a great pleasure. Kind regards ! 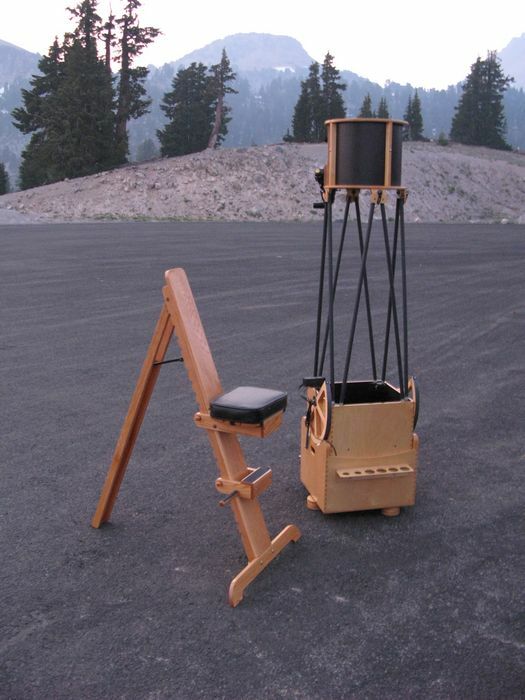 Ron, I am really pleased with my Summit chair. The construction is super, it is easy to use and the directions to assemble the kit were clear and easy. 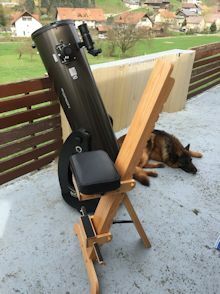 Since I’ve gotten it, I have found my observing sessions much more relaxing and less painful to my neck and back since I no longer have to contort myself using a ladder. 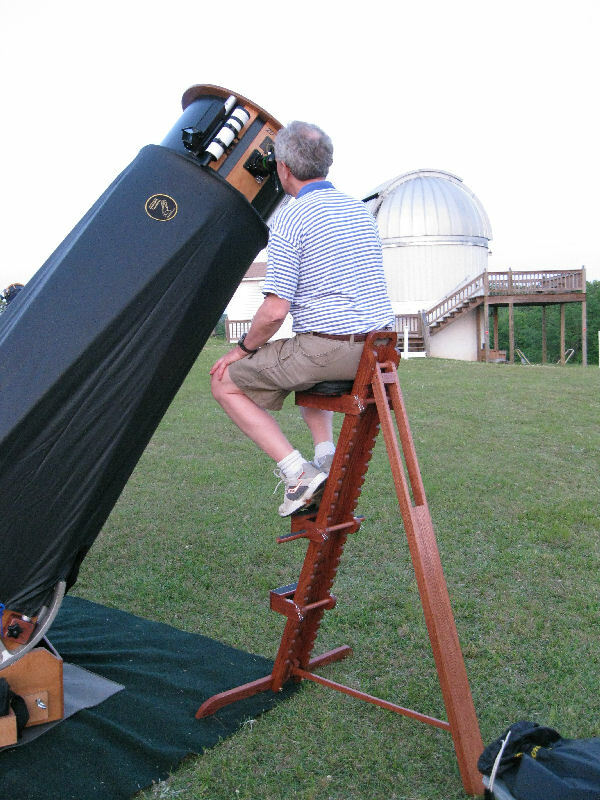 It works fine with any position that my 16″ dobsonian finds itself in. 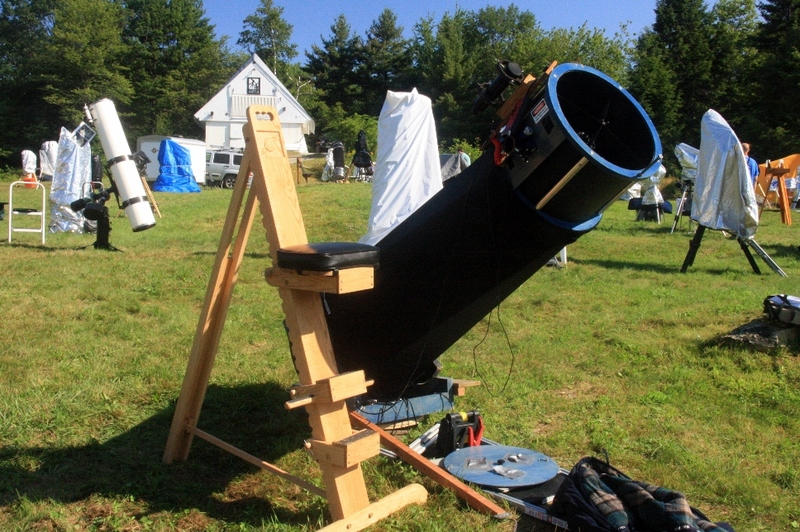 I brought it to Stellafane in Vermont this past weekend and I thought I’d send along a picture of it in front of one of the observatories. Thanks for the great chair–I love it! I received the Catsperch Pro chair and am delighted. I used it all last night and found it to be extremely comfortable, easy to adjust, easy to move around, and most importantly, stable. After 3 years of having a love/hate relationship with my SM20 ( I love the views and hate to use a ladder)- I finally found the perfect solution with the Catsperch. With a ladder I was always either caught between rungs in an uncomfortable position or, if I happen to be just at the right height to stand, I was clinging on to the ladder and not really comfortable. With the Catsperch, I am always at the righ height and I can sit comfortably and enjoy the views. 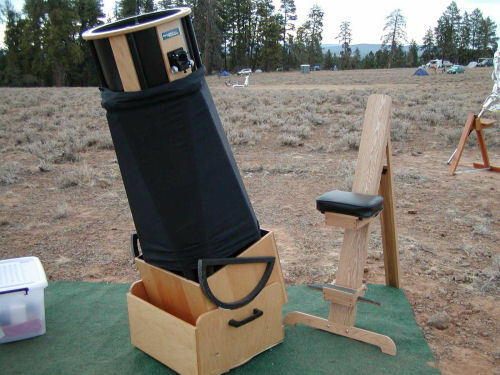 With the custom height, I can sit even with the scope at the zenith (Caution: it is so comfortable, I have to remember how high up I am when I get off). I may go with an extra step and with a seat cushion. Other than that, it is perfect. Ron, thanks for the incredibly fast construction and delivery. Thanks so much for the CatsPerch chair, it is really fantastic. I got the “Frazier Kit” and had a lot of fun putting it together, I stained it Colonial Maple to match my 15″ Obsession. Here is a picture, thanks again! Back in Nov ’07 I bought your Catsperch Pro kit and cushion. I finished it right way but was only recently able to use it. 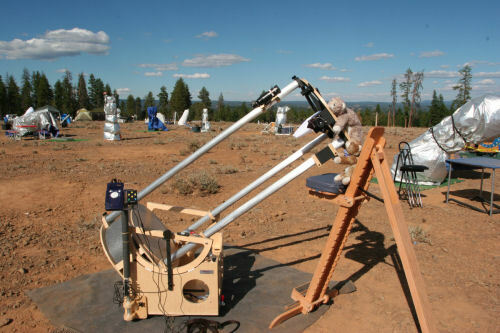 I have attached a photo of it and my AstroSystem 12.5 kit which has a mirror that I ground myself through most of ’07 at the Chabot Center in Oakland. The main view is on Mt Lassen at the Bumpass Hell parking lot at the top of the pass. 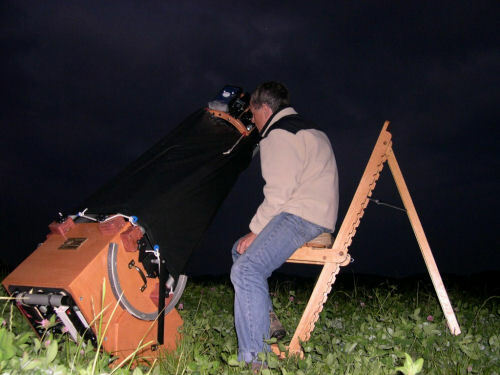 This was my first dark night site and first real chance to exercise both the chair and the telescope. This is a great chair, I love it.